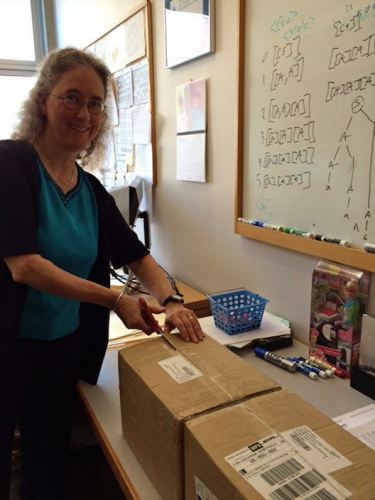 We printed our first edition using vendor below, shown being delivered to team-member Dr Susan H. Rodger. Scroll for how to do it yourself. You can download any deck or poster on this site for free and print it yourself using the instructions below. We decided to run a Kickstarter for the Notable Women in Computing Card Deck because a number of people indicated they would rather buy a deck than print one and we could bring the per-deck cost down with an order in the thousands. But we’ve always kept the option to self-print open and protected by our Creative Commons Attribution-NonCommercial-ShareAlike 3.0 U.S. license. If you print using one of these options, the deck will likely cost about $18 for one, down to $3 for thousands. Below is a step-by-step guide to printing cards yourself, organized by whether a given vendor allows you to produce cards that are good or fast or cheap or small-batch. (Scale is what brings the per-deck price from $18 to $3, so I had to add a 4th to the product managers’ triangle.) If you’d like to use our vendor, let us know and I’ll refer you. 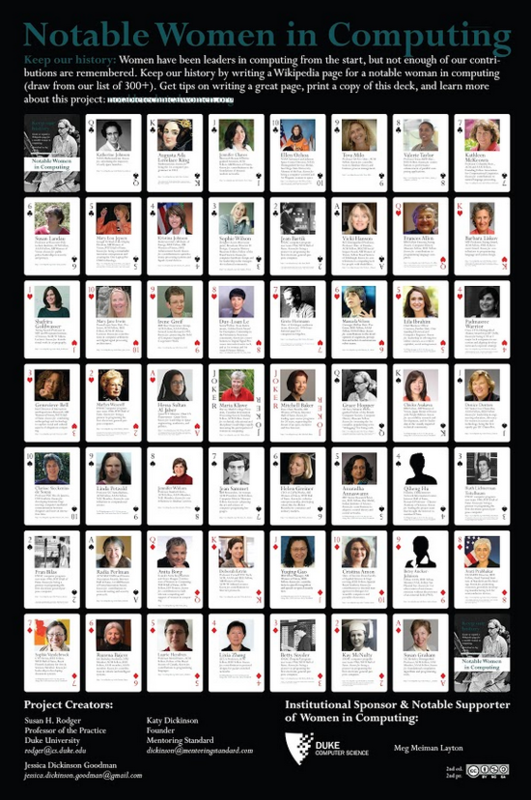 Before I start, you can browse all of the files referenced here for the Notable Women in Computing Playing Card Deck and the TechWomen Emerging Leaders in the Middle East and Africa deck and poster, all either jpgs or Photoshop files. If you’re looking for the holiday cards, you can download them here. Below are instructions on printing. Printing the poster is easy. Download the file here for the Notable Women in Computing deck or here for the TechWomen Emerging Leaders in the Middle East and Africa deck, send it to your local print-shop, pay for it, pick-up it, hang it up, brag about your awesome wall-art. If you want to edit the poster (make it bigger, make it smaller, add some Tartan-print to the background) you can download the editable files in the same place. If you need a deck today and don’t particularly care how fancy it is, this is the option for you. If you need a deck in 10 days, don’t mind it shipping from China, and want it to feel like a card deck. These files link to the first major printed version of the deck, which is slightly out-of-date. See note above or email jessica dot dickinson dot goodman at gmail dot come with any questions. Click Next Step. Ignore the options about a message on the card, and click Next Step. In the Preview stage, you can double check your cards against our list of who we’ve assigned for each suit and number. Then click the button saying “Yes, the images, names, dates and other information applied onto the cards are correct and I own all copyrights of them or have authorization to use them,” since we used images licensed under Creative Commons, in the public domain, or that we received explicit permission for them. Click Add to Cart and then check-out. One deck should cost $12.70 + $5.99 for standard shipping. The price goes down if you buy more than 5. Put your shipping info in and expect the cards in about 10 days. If you need a deck in 10 days, don’t mind it shipping from China, and want it to feel like a card deck. Some educators prefer jumbo cards because they make it easier for students in the back of class to see the text. These files link to the first major printed version of the deck, which is slightly out-of-date. See note above or email jessica dot dickinson dot goodman at gmail dot come with any questions. Upload all 55 image files (52 cards, 2 jokers, and 1 image for their backs) and drag them over to their respective cards. You can use the poster as a reference to place them correctly. Click Add to Cart and then check-out. One deck should cost $18.70 + $5.99 for standard shipping. The price goes down if you buy more than 5. If you need a 1,000 decks in a month, this is your option. Reach out to Gemaco (our chosen vendor for the second edition) for a referral to vendor (they only sell to printers, so you have to find a printer who will send your images to them–thus this not being a fast option). You want full color on custom face and custom back, with a coating to simulate linen card stock. Download the cards, which I’ve revised based on feedback from them to match their specifications. Pay them–it should be about $4.50/deck + shipping (which can be about $$4,498 for 1,000 decks). Wait 2 – 5 days for proofs, then 15 business days for production, then 4 – 5 days for shipping. It’s 20 business days for production if you want a custom box, with your company/university/Girl Scout Troupe number on it. Enjoy! (If you’re sending them to a lot of places–remember, the deck can’t be reproduced commercially—you might want to use a vendor like ShipWire for fulfillment) We no longer recommend Shipwire for any producers with sales of under $500/month, or, honestly, anyone doing a side project and who doesn’t have the bandwidth to spend months following-up with customer service reps. There’s a long story here, but the short version is it took 4 months and over $1000 to get our cards back from their warehouse, and hundreds of emails and phonecalls. They’re just not worth the hassle. More details here. Submit your request to Expert Playing Card Company (their website says they’re based in New York, but they confirmed over email they do all of their printing in Taiwan). Another option is Legends Playing Cards, but I asked for a quote a month ago and never heard back.